The first rule of getting married is: don’t talk about getting married. Ok, I’ll rephrase. Do talk about it to a select few people, suppliers for example, without whom the big day is pretty unlikely to even happen at all. Talk about it with enthusiastic friends and family, people you’ve not seen in a while or as a subject to fill that awkward moment when you’re stuck somewhere like a lift with a stranger and need to make small talk. But don’t talk about getting married to excess. There seems to be something about putting a ring on it that sends people just a little bit crazy. Women who are already married want you to be part of their club, suddenly everyone has an opinion on everything from designing the invitations to changing your name and people who previously expressed no interest in decoration, make-up or fashion are suddenly knee deep in baker’s twine and hessian, frantically pinning unrealistic images of fairy light-strewn country barns when their wedding will actually take place in a city centre. I’m not sure I’ve quite managed to stick to this rule. And with another six months until our wedding day I may well tumble further into the abyss of wedding-related boredom before then. Please tell me if I do. In a previous post I wrote about grand gestures and simple moments of which there could, perhaps, be no better example than a wedding day followed by spending the rest of your lives together. The day is what people remember, the life lived afterwards is what really matters, and while our wedding day will be incredible, it’s the rest of our lives bit that I’m really looking forward to. You’ll have ascertained from the soppy ramblings above, and previous posts, that I’m head over heels in love with my husband-to-be. My second love in life, something of which you’re probably also aware, is cake. And while I’m sticking to my guns is supporting the small things over grand gestures, that doesn’t mean I don’t want an absolutely epic celebration on our wedding day, complete, of course, with an utterly incredible cake. Fickle: perhaps, greedy: definitely, but (if you’ll pardon the pun), I want to have my cake and eat it. This weekend we briefed our wedding cake at a company called Choccywoccydoodah. As the name suggests, their several-tiered, personalized creations are completely covered in chocolate without a crumb of fruit or swirl of fondant in sight. This is my kind of cake. We’ve briefed a design that’s completely personal to us. I’m not going to spill the beans because it’s going to be a surprise for guests and I’m hoping to share some of the details with you all when we’re back from honeymoon in September (assuming you still want to know and haven’t been bored senseless by wedding chat in the intervening months). Suffice to say, it’s going to be good. You can’t really go wrong with three tiers of chocolate-crafted goodness. The first rule of getting married is not to talk about it. The first rule of driving blog traffic is to include your key words in the opening sentences of a post. But today I’m breaking the rules by talking about weddings and bringing you a plate of squid ink pasta: the perfect ending after all this talk of cake. Fishy, dark and delicious, this pasta is a riff on the simple tagliatelle I made a couple of weeks ago, subbing in some squid ink squeezed from slimy sacks (no need for those fancy packets, ask your local fishmonger and they’ll probably give it to you for free) and reducing the amount of egg ever-so-slightly. Served with chilli, garlic, parsley, picked white crab meat and a squeeze of lemon, this tagliatelle makes the perfect simple supper. Exactly what you want when you’ve been eating copious amounts of cake and talking about getting married too much. 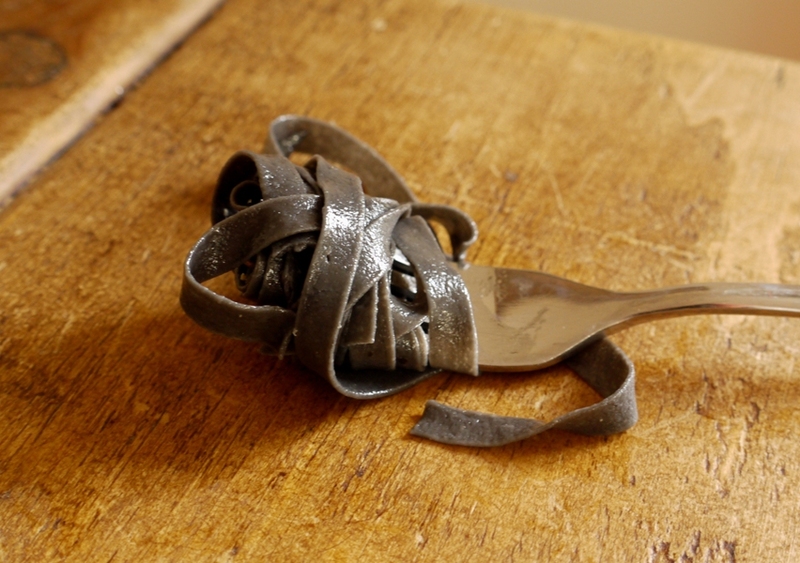 Mix together the squid ink and one teaspoon of water to form a paste. Put both flours into the bowl of a stand mixer, make a well in the middle and add all the eggs, yolks and squid ink mixture. Knead on a low speed for about 30 seconds until a crumbly dough is formed, then remove from the mixer and knead on a clean work surface until the dough is smooth and silky (about 5 minutes). If the dough feels a bit dry, add an extra teaspoon or so of water. Wrap tightly in cling film and pop in the fridge for one hour to allow the gluten to relax. Remove your dough from the fridge and divide into five roughly equal portions. Store four portions under a damp tea towel until needed (this will stop the dough drying out). Place the heel of your hand over the single dough portion and squash as flat as you can. With the pasta machine at its widest setting, pass the dough through the machine. Fold it over on itself, squish down once more and pass through the machine again. Repeat at least six times on this setting to bring the gluten to life – the dough will gradually become smoother and glossier with each roll. Gradually decrease the width between the two rollers, passing the dough through each setting a couple of times until you have reached your desired thickness. I rolled my tagliatelle to notch 5 on a Kitchen Aid pasta attachment – the thinner settings are really more suitable for filled pastas so don’t roll it too fine unless you’re looking for something really delicate. You will now have one long, thin sheet of pasta, ready for cutting. 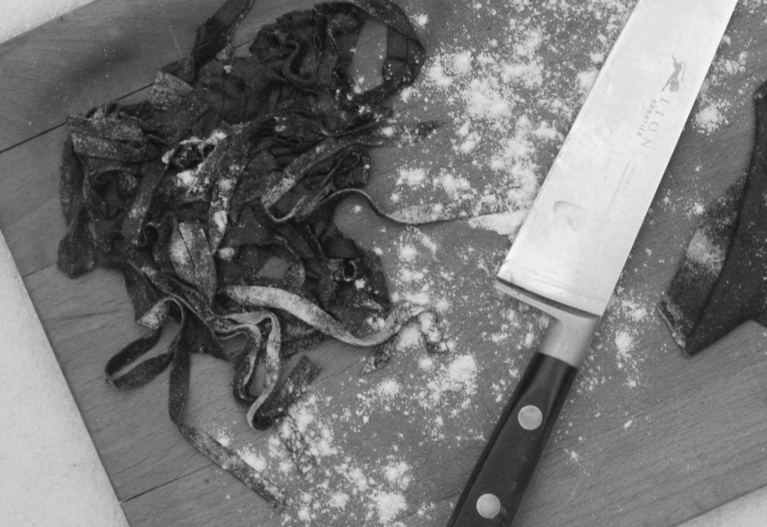 Cut the sheet to your preferred length – 40 – 50cm is about right – then dust lightly with flour and pass through the pasta machine using the tagliatelle attachment. Have a large floured tray ready and place loosely gathered bundles of tagliatelle onto it. Repeat the process for the remaining pasta dough. At this stage the pasta can be covered and stored in the fridge under cling film. You can also freeze individual portions, making sure they are well wrapped up. To cook the pasta, bring a large pan of salted water to the boil. Drop your tagliatelle into the water (about 100g per person is good), shaking off any excess flour. Cook for a scant 2 – 3 minutes, depending on how thick you have rolled it. Drain, season and combine with the sauce of your choice before serving immediately. Delicious pasta. With EU rules the ink has to be sold separate to the squid, so the fishing boats in the Ile de Re arrive in port with the decks, and the fishermen, covered in black ink. How exciting that your wedding cake is being designed by the amazing team at Choccywoccydoodah! We get their tv show here and their creations are so amazing. I wonder if your cake will be on their show 😀 I’m so excited for you. And as for discussing your wedding with people, I totally get what you’re going through. Even though we only had a 6 week lead up to ours there was an endless supply of opinions on what we should do and how we should do it. Thankfully I could use the excuse of a lack of time to ignore it and do things the way we wanted to. 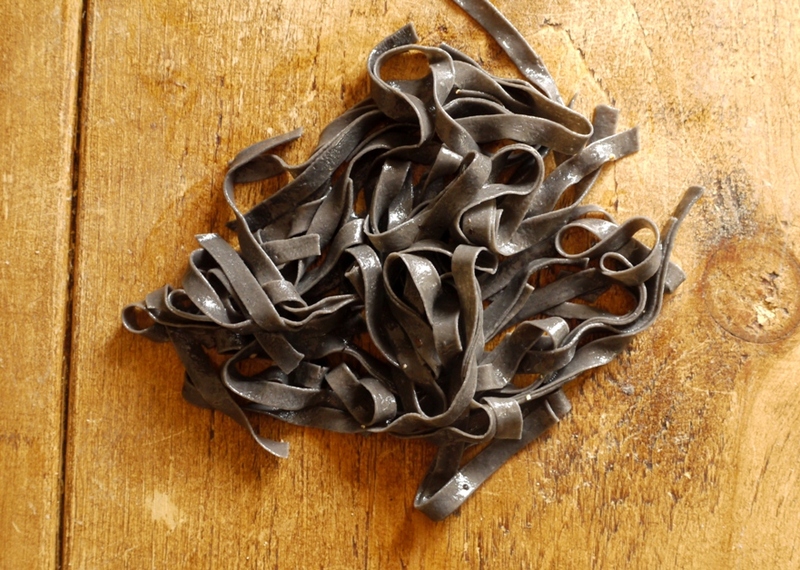 As for your squid ink pasta, it looks amazing. 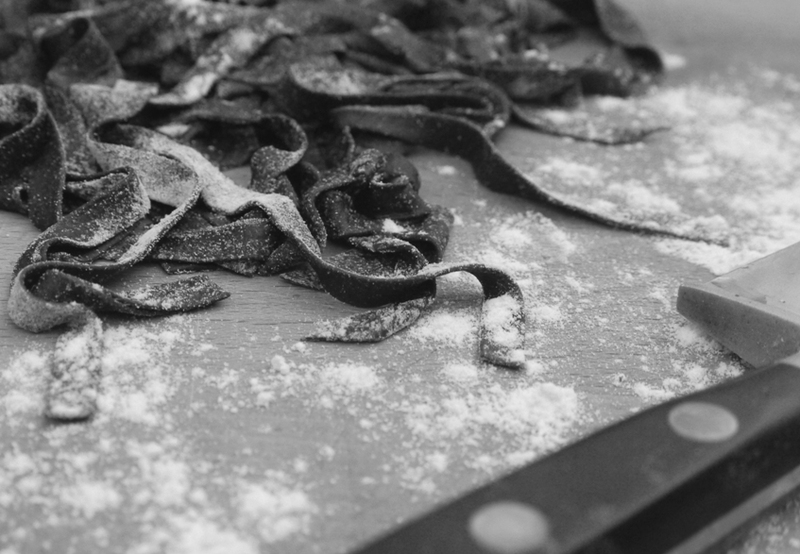 I always think squid ink pasta is so dramatic looking. I love pasta with crab. 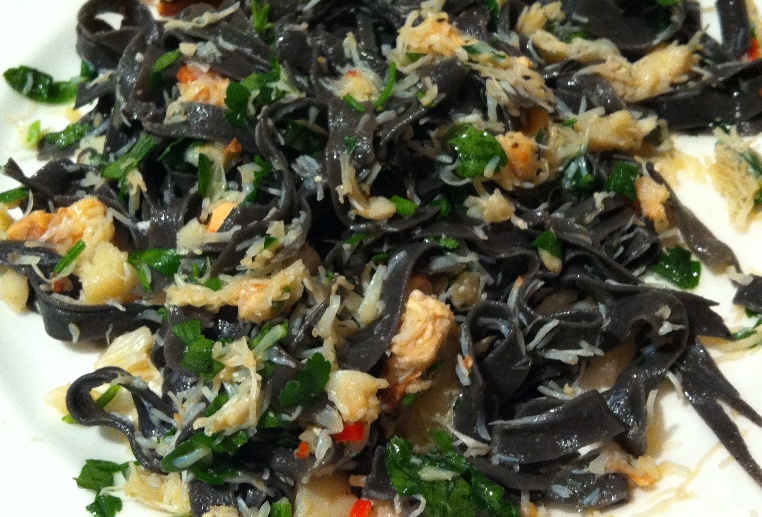 I’ve never tried squid ink pasta with crab – looks utterly delicious. Messy though, I bet! I am mighty jealous of your wedding cake! I first came across Choccywoccydoodah when I went to boarding school in Brighton as a teenager and I love love love their crazy chocolate concoctions – you can be sure your wedding cake will be an absolute showstopper (and no less delicious). 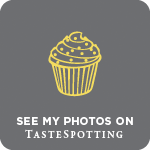 Love your squid ink recipe as well – that’s what I love about Italian cuisine, take a handful of high quality ingredients to create a dish tha allows every single ingredient to shine. Besides, the black pasta is so darn pretty! I knew their cakes looked amazing but I worried they might be style over substance…until we went tasting last weekend. All the cakes are made with ground almonds so they’re super moist and yummy! Am big into making pasta, and more so eating it, but have never made a ‘squid ink’ one. Yum, this Fridays menu sorted. Thank you for the inspiration. I used to make squid ink bread and serve beet root cured gravadlax on top , wicked colors and fab canapé! I skipped the whole wedding talk thing by just getting married when we got in to town (he proposed at the beginning of vacation). It’s worked for us for . . . wow, nearly 16 years. Time flies. Enjoy your wedding talk–and then enjoy your marriage, as that’s the whole point, isn’t it? I’m intrigued by squid ink–and it seems like a great change from chocolate. I have never tried squid ink anything but that pasta looks really good, especially with the crab, chilli and garlic. It’s making me very hungry but luckily I’m just about to finish work and head home for tea! You can talk about getting married as much as you want! The engagement period is a short time (compared to the single and married times of your life), so you should bask in it 🙂 Lovely pasta! I adore squid ink in pasta and risotto, but have never cooked with it myself. I’m inspired to try it now. Wonderful looking pasta and of course you know I approve of your cake choice! I can’t imagine ever going anywhere else for a cake that is chocolate heaven. So exciting! Brace yourself, organizing a wedding is just a rehearsal for pregnancy and having children. Just wait until everyone, even complete strangers, will start telling you what you should or should not do during pregnancy or telling you how to bring up/deal with your child, even when they don’t know them or their character (because kids do come with their own personality!) in the least. Love anything with squid ink. Choccywoccydoodah make THE BEST cakes! I was at their shop in Brighton and they were amazing. I hope you have a lovely day and the rest of your lives thereafter is equally lovely. I’ve never tried squid ink pasta! I love making homemade pasta! I’ve always wanted to try it with squid ink. Where do you get your squid ink? I got mine from my local fishmonger (just spare sacks so they didn’t charge me) but you can also buy it in little packets online which is much less messy! Oh this is beautiful! Totally in love with it. I need to undust my pasta maker. I haven´t made it in years, and am not looking forward to the mess, but homemade pasta is so fantastic, look at your lovely dark strands! This is a lovely post Kate. this looks really good! I’ve always wanted to try squid ink.